The newest game in the LEGO series returns us to a galaxy far, far away. Read our LEGO Star Wars: The Force Awakens PS4 game review on Kidzworld! It's cute. It's simple. 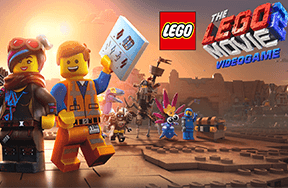 It's another LEGO video game. 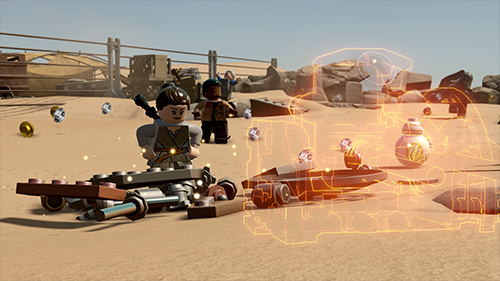 This time tying into Star Wars: The Force Awakens, the newest LEGO game is adding some much needed changes to the formula that has made these games successful but not enough to fully separate itself from past entries. LEGO games are set in their titular universes: Indiana Jones, Marvel's The Avengers, Batman, etc. You'll be smashing everything in sight and collecting studs and LEGO pieces of different colors. If you like LEGO and Star Wars this game is for you. If not, you'll have to keep looking as this is still very much a LEGO journey. The LEGO games obviously aren't about jaw-dropping graphics but this game has had a definite boost to its appearance. It won't be the best looking game you play this year but it'll be hard to find a game that beats the attention to detail shown of by TT Games. Everywhere you look there is either a reference to the source material, some other important piece of pop culture, or an innocent joke that anyone can smile at. You'll be playing through all of the major moments in The Force Awakens with audio recorded by a mix of the actual actors and really, really close soundalikes. Hearing Han Solo talk about Wookie Cookie's is even more charming when you hear Harrison Ford's voice saying it. I'm grateful that it has clearly become an unwritten rule that Star Wars games will sound like Star Wars movies. And if the story of the movie didn't satiate you enough, there are multiple off-shoot missions with your favorite characters. Save Admiral Ackbar as Poe Dameron, or figure out how C3PO got that red arm, or how Han and Chewy captured those rathtars or... well I could go on and on. Rey, Finn, and BB-8 fight and build to get off Jakku. Courtesy of Warner Bros. Different characters will have different character specific abilities and they always switch things up. Rey can parkour over walls, Finn's grappling hook makes swinging across gaps fun, and I smiled every time Chewbacca's strength helped him rip apart a wall in slow motion. You can even replay some of the levels as Jedi to use their force powers to find some cool secrets. 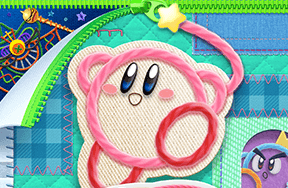 Everyone's fighting moveset is more or less the same across the characters with a mix of mashing square and occasionally pressing circle. There are new third person shooter segments where your character can pop out from cover to fire at Stormtroopers, like a lite version of Gears of War. Some of the cover battles can drag on to annoyingly long lengths and enemies will occasionally get stuck behind spots where you can't hit them. Similar to Star Fox, you'll find yourself in dogfighting space battles strapped into an X-Wing. Reliving scenes like Finn and Poe's escape feels so much fun it was disappointing how little they were in the main story. In addition to the space battles, I took any excuse I could to use a vehicle in the game. Whether riding a speeder across Jakku or flying a tie fighter, I was always having fun in these sections. All LEGO games are designed to be kid-friendly in every way and that extends to the puzzles as well. Nothing will leave you scratching your head and when in doubt it's safe to just smash everything in sight. You'll be building guns to blast open doors, elevators to lift you into air vents, and hooks to grapple across. With the earlier mentioned character specific abilities giving special powers to certain characters you'll often be unable to get into that secret room you've been eyeballing until you return with the appropriate character unlocked. And there are a lot of different characters, including a special appearance by JJ Abrams and Kathleen Kennedy. LEGO: Star Wars: The Force Awakens is at its best when played with a friend, or a parent, or a sibling. 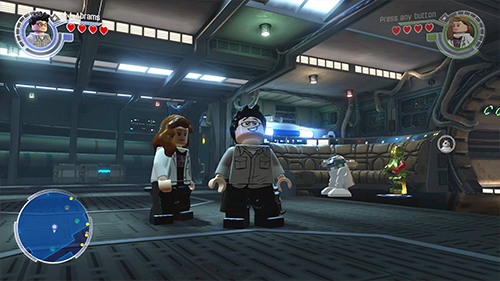 The LEGO games are the perfect games for parents to play with their kids, especially with the game's dynamic split screen which lets you better find where your Player 2 is. The game doesn't punish anyone too hard for dying, aside from a few lost studs, so it's always a satisfying outlet to get into an impromptu lightsaber battle with each other. The game may not be a challenge but it's certainly a fun way to mindlessly kill time. Mixing and matching different characters on your replay adds fun "what if" scenarios. Fight on Jakku as an Ewok while Luke Skywalker fights hordes of Stormtroopers or live out your Star Wars fantasy - just in LEGO form. If you want something new from the LEGO series then you'll be disappointed but if you want to settle in for some mindless Star Wars action then LEGO: Star Wars: The Force Awakens is an excellent excuse to return to the universe. The extra content, cute jokes, and awesome dialogue makes this game a stand out LEGO adventure. By the time I had finished all the main story missions I still had around 80% of the game left to explore. That included those extra story missions - which were probably the coolest part of the entire experience. This game is brimming with things to do, even if some of it is a little repetitive. Which LEGO or Star Wars games have been your favorites? 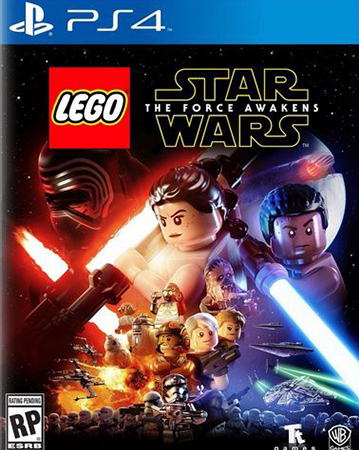 Will you play LEGO: Star Wars: The Force Awakens or will you wait for a future Star Wars game? Best Part of LEGO Star Wars? Being able to jump in anytime. Playing as all of the Star Wars characters. Using all the goofy powers. Getting Jar-Jar blasted over and over again!